Sunday, September 15th: Departure this morning from Grand Island with pick up a pick up at Bosselman’s I-80 Truck Stop. Continental breakfast served on the motor coach. We will stop in North Platte for a tour of the Golden Spike Railyard. Lunch (on your own) at Grandma Max’s in Big Springs. We will overnight at The Academy Hotel in Colorado Springs. Supper included this evening. 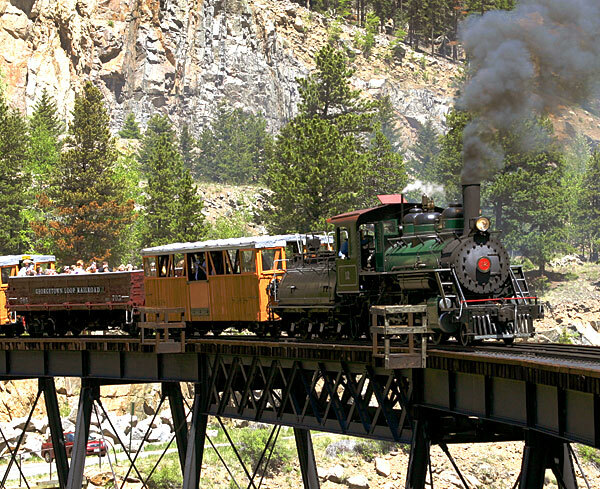 Monday, September 16th: Following breakfast (included) we will travel to Canon City for a train ride through the Royal Gorge! Boxed lunches provided on the train. Bring your camera as the views from the outdoor cars are an amazing photo opportunity. Supper stop on the way to Montrose, CO (on your own). Overnight at the Days Inn by Wyndham in Montrose. Tuesday, September 17th: Breakfast included. Get ready for a beautiful motor coach ride to the old mining town of Silverton, CO. We will arrive in time for you to shop the historic Main Street boardwalks and find a place for lunch (on your own) before boarding the train. 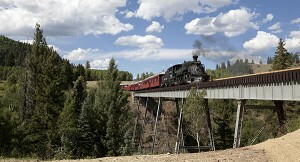 We will enjoy tranquil streams and mountain views as we descend down to Durango. Upon arrival, a short drive will take us to the luxurious Sky Ute Casino in Ignacio, CO. Supper is included this evening and plenty of time to try your luck in the casino before retiring to bed and getting ready for another fantastic train ride tomorrow! Wednesday, September 18th: Breakfast included. Full day train ride that winds in and out of New Mexico today! 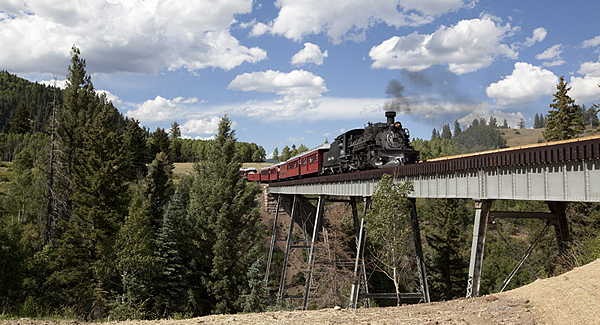 All aboard the Cumbres Toltec Train which is famous for appearing in several movies. The ride from Chama, NM to Antonito, CO will provide wildlife viewing and some spectacular vistas as we ascend over mountain passes. A lunch stop on the mountain is sure to fill you up for the remainder of the ride into Antonito. Overnight at the Hampton Inn, Alamosa. Supper included at San Luis Valley Pizza Company. Thursday, September 19th: Breakfast included. Departure from Alamosa today on the Rio Grande Scenic Railway. This ride takes up far into the mountains on historic rails completed in June of 1878. Experience the curves and winding ride along the steep grades and through mountain meadows where elk, eagles and bears cohabitate the land! We will arrive int he mountain town of La Veta where you will have time to explore the shops and grab a bite to eat (on your own) before boarding our motor coach for a journey back to Colorado Springs. Overnight at The Academy Hotel. Supper included tonight at the Cracker Barrel. Friday, September 20th: Following breakfast (included) we will head for home with great memories of our trip on the rails through the mountains of Colorado! Lunch stop along the way at Ole’s Big Game Steakhouse in Paxton (included). Reservations through August 1st or as space is available. Cancellation Policy: Deposit is refundable until time of final payment. If cancellation is made after final payment is paid, a refund will be given, less any amount that is nonrefundable to Gannon Travel. If cancellation is made September 13th or later, the entire amount is nonrefundable. Cancellation insurance is available upon request. No fee will be charged for name changes.